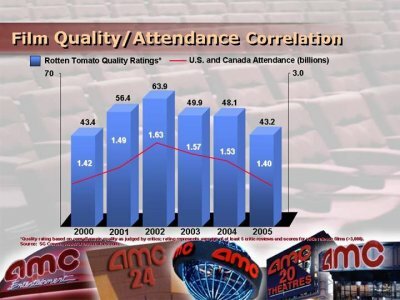 Movie theater chain AMC has talked a lot about the potential causes of box office decline. This slide, filed with the SEC, shows that box office receipts have decline in tandem with the number of rotten tomatoes per movie. Quite frankly, I do not understand why movie audiences enjoy watching movies in theaters with rancid fruit but it begs the question: Why haven’t the movie theaters increased their tomatoes per theater allocation? Recommendation: Domestic theater attendance may be trending 3-4% positive YTD, but until we see evidence that this is due to higher rotten tomato/screen ratios, we cannot recommend a long position in any of the publically traded theater companies such as Regal Entertainment (RGC) or Carmike Cinemas (CKEC).